This CD contains the ending song for the TV anime Venus Project -Climax-. 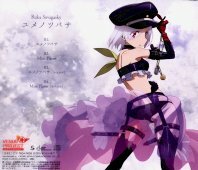 "Yume no Tsubasa" by Ruka Sovagasky, voiced by Iida Riho (飯田里穂). "Mint Flavor" by Hara Eriko, Ruka Sovagasky, and Nureha Miu, voiced by Hata Sawako (秦佐和子), Iida Riho, Hayase Marika (早瀬莉花). For "Mint Flavor", the lyrics have markers to show which parts are sung by which girl.